In 1779, Jacob Drake Jr. took over this beautiful old farmhouse, which was built around 1752, at the crossroads of Oakdale Road, Dover Chester Road and Main Street. He converted it into an inn. A few of the names it has held during its 183 years of operation were Jacob Drake's Tavern, Crossroads Hotel, Union Hotel, Flagstaff Inn, and Dean's Crossroads Inn. After it burned down in 1962, the lot sat empty for some time until the Immediate Medical Care Center was built. 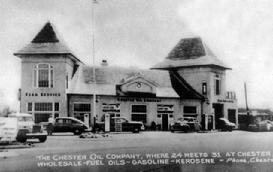 This is the Chester Oil Company that sits at the intersection of Rts. 206 & 513. It was once thought to be one of the train stations, but it was never used that way. It used to have apartments and a resturant at different times. Thomas Topping came from Southampton in the 1750s or 1760s and was the first to own the property pictured here. It was just a small farmhouse originally, and after Toppings death in 1777, Dr. Joseph Hedges purchased the farm. It started out as a restaurant in the mid-1940s and was called "The Wo Wanda," then the "Maple Tree Inn," then "The Twins Inn," "Sweeney Todd's," and as it is today, "The Lamplighter." 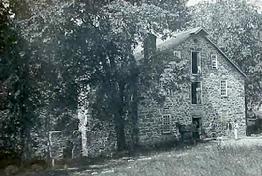 This grist mill pictured here along Hacklebarney Road is called the Lower Hacklebarney Mill and was used for grinding corn and grains. It is know to have operated from 1828 to at least 1916 and there was a blacksmith shop located nearby. In 1906 L.T. Current purchased the Depot House at Muskrat near the D.L. & W. Station and renamed it the Anthracite Hotel. In 1912 he added on a sizeable addition and moved the bar up to the first floor. In 1925, after prohibition had “spoiled” business, Mr. Current sold the business to William Kohler, who then sold it to Edward Hann. After the trains stopped running, Mr. Hann continued to operate the tavern with “rousing cockfights.” After his death, the tavern was left to his niece, Luella O’Neil who then sold it to Bernie Wallace. Not only named after the new owner and the road it sits on, the tavern is now called Bernie’s Hillside. At the time of Chester�s Centennial (1899), there were three hotels; the Chester House, the Union House at the Crossroads and the Depot House, which was near the Lackawanna Railroad Station. Charles Cumback was the proprietor at that time. 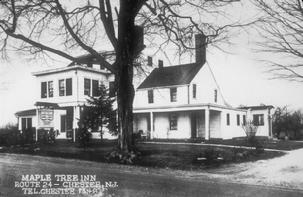 Andrew J. Rockafeller managed several hotels in Chester, one of which was the Depot House in which he worked for several years before 1906. Actually, he bartended for the owner, Charles Cumback, and after his death, continued on for Mrs. Cumback. 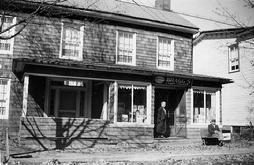 His brother was John P. Rockafeller who owned the Milltown store which is now the Old Mill Tavern. 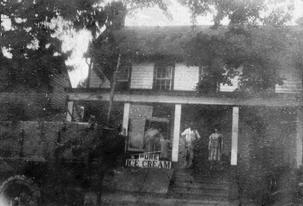 In 1906, Lorenzo T. Current, who was a butter man working in the Huntsville Creamery in Sussex County, was on route to Whitehouse Station to visit his stepfather�s brother who ran the creamery there. As he left from Newton by horse and spring wagon, he traveled down through Andover, Cranberry Lake, Stanhope, Netcong, Flanders, Bartley and then came into Chester. Along that very narrow dirt road, he stopped into a tavern near the railroad station for some rest and refreshment. Mr. Current found out that the establishment was for sale and he took a notion to buy it and he did. Lorenzo, along with his wife Arminda and their three daughters, Hazel, Blanch and Bertha moved to their new home and put on a large addition and called it the Anthracite Hotel. The name Anthracite came from the type of coal that the trains carried through the area. At that time, it was a three bedroom frame house without a porch. The ballroom/bar was downstairs and along with the addition to the house, Lorenzo also built the barns in the back which were used as a livery stable and an ice house. In that day, the Anthracite was a �travelers place� or a �transient place,� as there would be people going by on the road or coming in on the train. After the addition was built, there would now be room for travelers to stay overnight. Some of the guest would be the workers from the railroad, such as the conductors, the brakemen and the engineers. At one point they had a total of 33 boarders, which was probably during a storm and were mostly linemen. Lorenzo fed the linemen well with a hot dinner and soup and Arminda would pack their lunch for the next day. In the summertime, many apple pickers would come out from New York on the trains. Some would have purchased the whole orchard and just come out to pick their apples. Lorenzo and Arminda were known for their wonderful meals at the hotel and when the �lay over crews� came in from the railroad, they enjoyed not only clean rooms but the freshly prepared food also. Hazel Apgar, daughter of Lorenzo Current, recalled the extra service they also provided, especially one time during an ice storm when 39 passengers, the crew and linemen were stranded on the train in Port Murray, and her father hitched up the buggy and drove there to take them hot soup, coffee and sandwiches. Since there were no refrigerators and Lorenzo had a pond behind the hotel, he would take his horse out on the pond and pull in cakes of ice and store it in his ice house which was also behind the hotel. The cakes of ice usually were about a foot in each direction and the thicker the ice, the better! When stacking the ice, they would put one in one direction and the next in another and stack it up to the top of the building. They then would fill it with sawdust to give it some insulation. When they needed ice in the ice boxes inside the house and hotel, they would have a ready supply. Another wonderful story that Hazel recalls, was seeing a �Krueger�s Beer� keg sitting alongside the barn, which was out behind the hotel. At the base of this barrel were many little piglets and the barrel, filled with milk, was acting as a surrogate mother for the piglets. There were feeding tubes all around it and the family raised the whole litter of pigs this way. Lorenzo had even sent the Kruger Beer Company a photo of it, thinking it would make a great advertisement, but he never heard back from them. This same keg is in the photo of the family in front of the hotel. The DL&W Train Station sat at an angle was just across the street from the Anthracite Hotel. The trains not only carried passengers down to Dover, but also carried the local produce and milk from the farmers. Just down the line from the hotel was a creamery owned by Mr. Holthufan. This is where the farmers would bring their cans of milk to be shipped out. If the train had already left, they would just set the cans down in the back where the cold spring water was, and the next day they were picked up and taken out on the train. 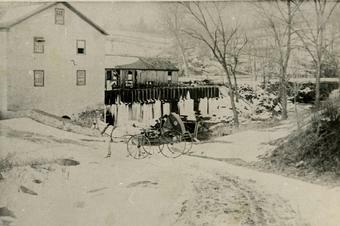 The creamery sat alongside the tracks for easy loading and unloading and was close to Pleasant Hill Road. It still stands today as a private residence. After growing up at the hotel and seeing how things operated then, Hazel often wondered why we are all so fussy about milk now and that it has to be pasteurized and all. She remembered how that milk was just fine and never remembering the farmers having to sterilize the cans they used. During the prohibition time, the hotel was almost ruined. Of course, like many other places in Chester during that time, you could still obtain your �beverage of choice� because many had their own stills in operation. Hazel remembered that when the ABC Federal Cops came to check on the operations of the Saloons, Lorenzo dumped the mash contents of the still out behind the barn and all the chickens got drunk. Rick Apgar (Hazel�s grandson) can also recall Lorenzo�s old still that was used during the prohibition and that it was kept in the cellar under the steps. Lorenzo passed away in 1922 at the age of 46 and Arminda kept the hotel going and remarried a trainman who was boarding at the hotel. They had a baby and Arminda passed away soon after giving birth at age 48. The hotel was eventually sold to William Kohler, who then sold it to Edward Hann. After the trains stopped running, Hann continued to operate the tavern with some �rousing cockfights� as entertainment. After his death, the tavern was left to his niece, Luella O�Neil, who then sold it to Bernie Wallace. Bernie Wallace, Jr. now operates it as �Bernie�s Hillside� and they still serve food and have music on the weekends. Stop in there sometime, have some food and drink and dream of days gone by�.. This is the store/luncheonette that was run by John S. and Jennie Wyckoff. The building sits along Main Street, west of the brick hotel. 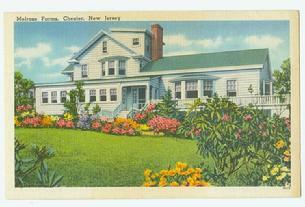 The Wyckoff family moved to Chester from Readington, NJ in 1798. This farm belonged to the Mercadante family and in the 1960s, a new type of independent, interdenominatioanl church came to Chester. It was called the Grace Bible Chapel. The original farm produced not only regular farm crops, but also raised chickens.